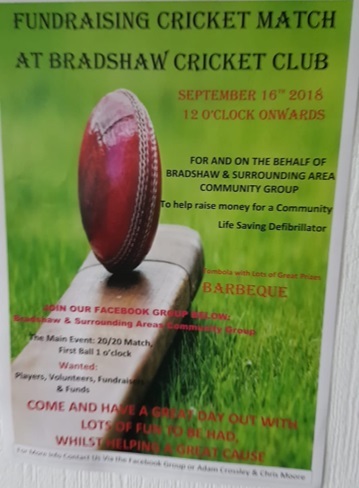 Bradshaw Cricket Club will be holding a fundraising match on Sunday 16 September, 12:00pm at Bradshaw Lane, Halifax HX2 9XB raising money for a community defibrillator on behalf of Bradshaw and Surrounding Area Community Group. There will be a barbecue and tombola with lots of great prizes. Have a great day out at this 20/20 match with the first ball being bowled at 1:00pm.